The Educational Resources Center library on Main Campus was dedicated in March 1987. As Durham Tech has continued to grow, so have our libraries; Northern Durham Center opened in October 1993 and the Orange County Campus library opened in August 2008. Our mission is to provide the Durham Tech college community (students, faculty, and staff) with the resources need to support the college curriculum and ensure student success. Currently our collection houses over 43,000 items, which include books, journal subscriptions, and audiovisual materials. In addition we offer access to over 240 electronic reference sources. All three libraries offer computers with Microsoft Office and internet access. Wireless internet access is also available in the Main Campus library and in the Orange County Campus library. 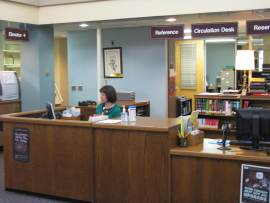 In addition to our library director, we have five reference librarians and three library technicians on staff. We offer library instruction to students on all campuses. We are constantly striving to improve our services and facilities. We invite you to come and check us out!